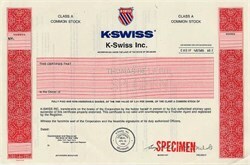 Beautifully engraved Specimencertificate from K Swiss Inc. printed in 1990. This historic document was printed by Thomas De La Rue and has an ornate border around it with a vignette of the company logo. This item has printed signatures by the Company's President and Secretary and is over 14 years old. 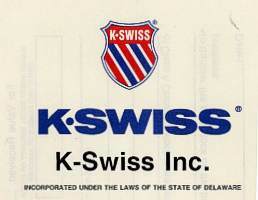 K-Swiss was founded by two Swiss brothers who became avid tennis players after moving to Southern California. In 1966, they introduced the K-Swiss "Classic," the first all-leather tennis shoe with a one-piece rubber outsole, reinforced toe-design, five-stripe bands on each side, and D-Ring lacing system. Since then, K-Swiss has continued to build on its performance heritage with new footwear for serious tennis players, as well as training shoes for all athletes. Today, the "Classic" still enjoys popularity as a clean, original, athletic look that is always appropriate off the court.